Just a quick note on a couple new features that you may not have noticed yet. You can now upload multiple projects to your account. Once you have multiple projects uploaded, you choose which items to view by selecting the desired project in the menu bar. When you share items for review, reviewers will only be able to see items in the project you’ve selected. This means you can upload projects for multiple clients and be assured that client A won't have access to client B's project. You’ll need CaseComplete version 6.0.4253 or later in order to take advantage of this feature. We also introduced search capability last week. As with most web search engines, an item will be included in the results if it contains any of the search terms. 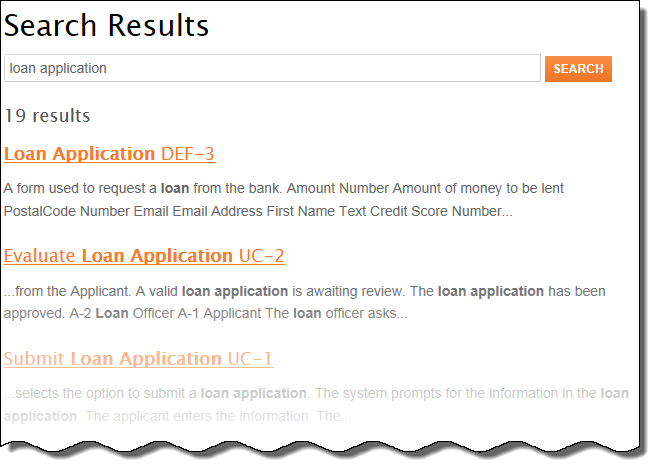 For example, searching on loan application will display use cases and requirements that contain loan or application, with priority given to items that contain both terms. 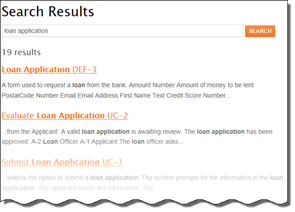 And, as you might expect, searching for “loan application” with quotes shows only those items that contain the exact phrase. Looking ahead, we’re currently implementing a ranking mechanism, for example to get stakeholder feedback as to which use cases are most important to them. If your organization has a favorite ranking or voting technique, we’d love to hear about it.